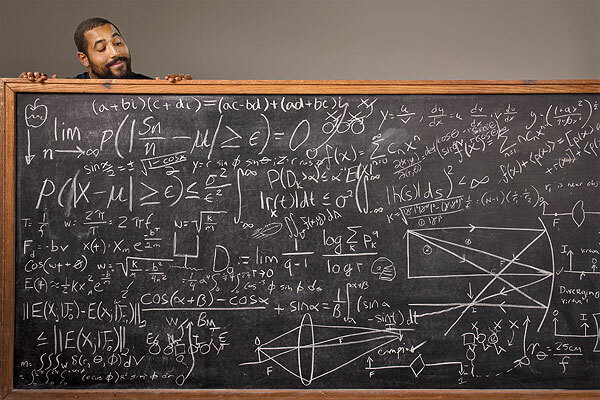 John Urschel does the math for ESPN The Magazine. Photo by Gregg Segal/ESPN. Analyze this: Ready for some math talk? Penn State All-American/mathmetician John Urschel ’12, ’13g proved his own theorem, officially called the Urschel-Zikatanov Generalized Bisection Theorem, and it was accepted by a top journal in the field of spectral graph theory. Don’t know what any of that means? Me neither. But it’s a big deal — and thanks to ESPN The Magazine, Urschel recently had the chance to show off his skills in a more accessible arena. In the latest issue, Urschel authors a feature for which he analyzed player stats and determined how 400 top college linemen will perform in the NFL. To put Urschel’s genius in perspective: I have no idea if those Good Will Hunting-style chalkboard calculations (above) are real, or a prop. First-time foes: The men’s hockey team is headed to Madison Square Garden next winter. It was announced yesterday that Penn State will meet Cornell in The Frozen Apple on Nov. 29, 2014. It’s the Nittany Lions’ first appearance in the famous arena — and the first time Cornell and Penn State hockey face off as NCAA Division I foes. Entry filed under: Uncategorized. Tags: John Urschel, The Frozen Apple, Tiffaney Jarrett. John Urschel is awesome. Some friends that are FSU alumni sat with him at the national championship game and they were so impressed by him that they reached out to let me know from California, right after their team won. He reps PSU very well!